Christopher Schwarz is often asked to recommend books for the woodworker interested in working with hand tools. Back in 2007 he created such a list, and at the top was Robert Wearing’s modern classic “The Essential Woodworker,” which was unfortunately out of print at the time. As Robert Wearing eases you into his book during the introduction, you will be both encouraged and alarmed. “The Essential Woodworker” is indeed a book on hand-tool basics and covers all the basic furniture-making tasks necessary to build tables, cabinets, doors and drawers. That’s the encouraging part. What is alarming is that the stuff in “The Essential Woodworker” is material that is rarely covered in magazines, books or classes. In other words: This book is a good part of a nutritious diet in a world of Snickers bars. 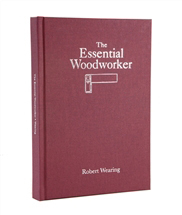 “The Essential Woodworker” begins with a chapter on basic operations: sharpening, planing, sawing and boring. Wearing teaches his techniques mostly with hundreds of simple and clear line drawings, though there are a few black-and-white photos scattered throughout. With the basic skills wrapped up, Wearing launches into a chapter on building tables and stools. Good choice. Tables are an excellent project for beginners. As Wearing introduces each essential skill, he shows you how to accomplish each task at the bench. This information is like a slice of fried gold. This book is the one that taught me how to clamp up a table base to my bench to work the aprons. It showed me how to size door parts without measuring. It taught me a better way to make hinge mortises that I still use today. After mastering the table, Wearing moves onto basic carcase construction, with particular emphasis on dovetailing the carcase components and fabricating backs that are far more interesting than what you read about in most books. In other words, there is detail here that you just don’t find elsewhere. Then Wearing finishes up with designing, building and fitting drawers. By the end of the book’s 160 pages I think I’d learned as much from this book as I’d learned from 10 other books purporting to “essential” for the hand-tool woodworker. Are there any downsides to the book? Well, I think you can skip the parts about doweling carcases together, that’s a technique that I don’t cotton to (for all the effort required in doweling, I’d just dovetail it). This review reprinted with the permission of Chris Schwarz. Click to order a copy of The Essential Woodworker.